Driving down the road to the cottage last June we came across several cars pulled over to the side of the road. So we pulled over too. Looking around the vehicles we could see a snapping turtle in the middle of the road. Fortunately for this turtle there were people prepared to help. One person managed to move the turtle over to the side of the road. We asked is that way the turtle was heading? They answered no…is that important? Yes it is! So the turtle was moved again this time to the side of the road where it was originally headed. This turtle was not large which made it easy to handle but snapping turtles, the largest freshwater turtle in Canada, can be very large with adult turtles weighing from 4.5-16 kg. If they feel threatened on land they can also be defensive so you need to have a plan when you are moving them. How do you know it is a snapping turtle? Like all turtles snapping turtles have an upper (carapace) and lower (plastron) shell. The carapace of an adult snapping turtle averages 20-36 cm in length (maximum 47 cm). This carapace can be green, brown or black in colour and is serrated on the rear margin. As these turtles spend much of their time in the water the carapace is frequently covered with algae. The lower shell, the plastron, of snapping turtles is small, almost cross-shaped, and yellowish in colour. In fact, the plastron is so small it leaves much of the snapping turtle’s underside unprotected and the snapping turtle unable to tuck its head and legs back into their shell to avoid predators. Their legs are brown and their feet are webbed with long claws. The brownish coloured head is large, with strong, snout toothless jaws that are sharply hooked. The skin on its neck is rough and covered with rounded tubercles. The tail has triangular scales along the top, is thick at the base and is as long as the carapace. In the water, snapping turtles rarely snap at people or other potential threats and will move away if threatened. When threatened on land however the snapping turtle’s only defense from predators (or humans trying to help) is to react aggressively, rising up on its legs and hissing with its mouth open. They can lunge forward snapping their jaws and as they have a long neck they have a long reach. When stressed they can also release a foul odour from a gland on the underside of their body. The snapping turtle occurs in Canada from South eastern Alberta to Nova Scotia. It is found in southern Ontario freshwater habitats, and is most often found in shallow slow-moving water, small wetlands, ponds and ditches with a soft mud or sand bottom where there is abundant vegetation. Snapping turtles need to breathe air. They generally hide under the vegetation with only their nose out of the water but occasionally they emerge from the water to bask in the sun. Most of the time is spent in the water moving by walking on the bottom rather than swimming. During the winter snapping turtles hibernate in the mud or silt on the bottom of lakes and rivers. They are omnivorous opportunistic feeders, feeding on aquatic plants and invertebrates, as well as fish, frogs, snakes, small turtles, aquatic birds and carrion. Approximately 90% of their diet consists of dead animal and plant material. They play a beneficial role in cleaning lake and wetland areas by consuming anything edible. So why was this turtle crossing the road in June? Snapping turtles move from their fresh water habitats to search out food, mates and nesting sites. The turtles start mating in April. Then in late May – early July the female snapping turtles search out good nesting sites. 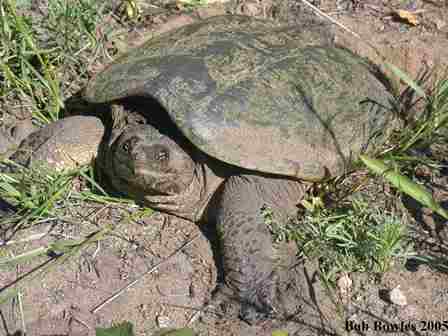 The female snapping turtle will generally dig a nest in an open area, where there is loose, sandy to gravelly soil. The nest site is often at the side of a road, an embankment or a shoreline, but the females will use almost any area they can excavate including flower beds. Generally the nest sites are close to water. Once she has dug the nest she will lay a clutch of 40 to 50 eggs. The white ping-pong ball- like eggs have a hard, brittle shell, are 23-33 mm in diameter and weigh 5-15 grams. The female will then cover over the eggs which will incubate for the next 55 to 125 days (average 75 and 95). As with other turtles the incubation temperature of the eggs determines the gender of the hatchlings. Eggs incubated at temperatures between 23-28 degrees Celsius will be males. Eggs incubated at other temperatures will be female. Nests are vulnerable to predation by raccoons, foxes, skunks and opossums. Hatchlings are two to three cm in length. The snapping turtles become sexually mature relatively late in life (15-20 years) and adults are normally long lived in the wild (average 30-40 years – up to 70 years for some individuals). The loss of even a few adult turtles from a population every year is enough to cause population decline. Snapping turtle populations are vulnerable (listed as Special Concern under the Ontario Endangered Species Act and the federal Species at Risk Act) to threats such as road mortality, hunting and poaching. So what can you do to protect snapping turtles? If you see a turtle on the road, and it is safe to do so, stop and help the turtle to the side of the road in the direction that it was headed. Do not pick the turtle up by the tail as this can damage the vertebrae of the turtle. Do not pick it up by the sides as they have a long neck and could snap at your hands. Do not drag it as this could damage the unprotected underside of the turtle. Use a car mat, log or shovel to help move it across the road. The Toronto zoo website has an excellent video (http://www.torontozoo.com/adoptapond/turtleresources.asp?opx=6) on how to help a snapping turtle cross the road.